The Milwaukee Brewers’ 2011 season is nearing it’s collective climax, but if you’re anything like me, you can’t help but take a quick glance into the future. In case you haven’t already noted, All-Star first baseman Prince Fielder is set to become an unrestricted free-agent at season’s end. Speculation around the league says he — along with Cardinals first baseman Albert Pujols — will undoubtedly be the hottest free agent strolling the market. To no surprise, analysts and skeptics believe the Brewers won’t be able to afford their attractive superstar. Who could blame them? Milwaukee’s roughly $85 million payroll was just enough to trade for Royals ace Zack Greinke and Blue Jays starter Shaun Marcum in the offseason, much less acquire Mets closer Francisco Rodriguez prior to the non-waiver trade deadline. Brewers owner Mark Attanasio has defended his stance that Milwaukee will be able to afford their slugging cleanup hitter at season’s end. 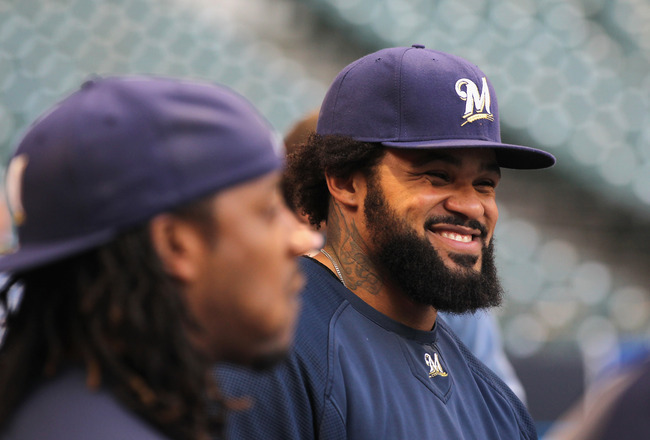 Whether or not Milwaukee is able to resign Fielder this winter is irrelevant at this point. There are plenty of question marks hampering next season’s outcome. Before we begin, let’s get a general overview of what needs to be improved. As it stands, LaTroy Hawkins, Craig Counsell, Yuniesky Betancourt (who maintains a 2012 option) and Fielder are all set to become free-agent this offseason. It shouldn’t be too hard to fill their shoes — with exception to Fielder’s — but moves will need to be made and signings are imminent. Third Base: Is Casey McGehee the answer? Milwaukee’s primary third-baseman had a career 2010 campaign, compiling 23 HR, .285 BA, .801 OPS and beat out both Ryan Braun and Fielder for the team lead in RBI (104). Expectations may have proved to be a bit too high in 2011, as McGehee’s .238 BA, 12 HR, 65 RBI and an appalling .295 OBP have been anything but impressive. The emergence of prospect Taylor Green in September could be something to watch this offseason. Bullpen: Is it solidified enough? The addition of Takashi Saito last offseason has worked out decently thus far. Last season, Milwaukee’s bullpen ranked 26th in all of baseball in ERA (4.58). This season, things have turned around quite dramatically: posting a team ERA of 3.64, the Brewers now rank eighth in MLB. The addition of K-Rod following the All-Star break also helped, as you can imagine. With LaTroy Hawkins likely leaving, the Brewers will need added depth to the ‘pen. Shortstop: Will the Brewers pick up Betancourt’s 2012 option? At times, Betancourt has proved to be an all-around elite shortstop at the MLB level. At the same time, though, he’s struggled to hold down the fort at shortstop, which makes his winter all the more intriguing. Will the Brewers pick up his 2012 option? If not, we could be in for quite the offseason with Melvin looking to upgrade via trade or free-agency. The Rangers successfully snatched up the 33-year-old Gonzalez just hours before the waiver trade deadline, but rumors suggest the Brewers were very much entrenched in discussions for acquiring the veteran left-hander. Truth be told, Gonzalez hasn’t played up to his capabilities lately. Posting a 4.01 ERA in his first season with he Orioles last season, along with a dismal 4.27 ERA in 49 appearances with Baltimore in 2011, Gonzalez was anything but dominant. However, don’t get too discouraged. In his best season as the Braves’ set-up man/closer, Gonzalez amassed 17 HLD, 10 SV and a stunning 2.42 ERA in 74.1 innings of work. If he can muster up the ability to produce as he did just a few seasons ago, the Brewers would be foolish not to pursue him. Francisco has become one of the most overlooked and under-appreciated power-relievers in the game today despite his impressive career 9.88 K/9-inning ratio. The Brewers have plenty of right-handed relievers ready to step in whenever called upon, but few have the stuff the 31-year-old Francisco has: a power fastball with great command. He’s relatively younger than what most would expect, so signing him may be a bit more costly than previously expected. You can’t argue with what he brings to the table, though. The Brewers had their sights set on the streaky Barmes prior to the July 31 trade deadline, but a deal never quite came to fruition. Barmes and Betancourt have the same career fielding percentage as shortstops (.970), however Barmes provides much more pop in the batter’s box. Not even in our wildest dreams. Another unheralded reliever, the 34-year-old Sherrill would not only be an ideal addition to Milwaukee’s bullpen, but he would also be a cost-effective reinforcement in potentially resigning Fielder. Although the Braves placed him on the 15-day disabled list back on August 27, Sherrill was in the midst of a solid season by all accounts. Carrying a 3.00 ERA, 1.25 WHIP, 7 HLD while striking out 38 in just 36.0 innings pitched, Sherrill was just one of many talented hurlers featured in Atlanta’s impressive bullpen. Sherrill is due to make $1.2 million in 2011 — which, for all intensive purposes, should make him one of the most practical candidates on the market to replace Hawkins next season. Doug Melvin — I’m looking at you. Assuming the Brewers and Casey McGehee aren’t able to restructure a new contract/extension this offseason, things could get a little dicey regarding who should play third base for Ron Roenicke next season. Mat Gamel has been waiting in the wings down in Triple-A Nashville for quite some time now, but with Fielder likely leaving, he could (and should) be Milwaukee’s first baseman in 2012. With Taylor Green making a name for himself in his stint with the club, he could be starting at the hot corner next season for all we know. But with veteran Craig Counsell also leaving in all likelihood, the Brewers will need to restock their depth chart. This is where Betemit comes in. Milwaukee had been looking to trade for Betemit’s services around the July 31 trade deadline. Bringing a above-average glove and tolerable bat, the 29-year-old Betemit would be a solid addition by and large. How Bell wasn’t dealt at either the non-waiver trade deadline nor the waiver deadline amazes me. If the season ended today, San Diego’s boisterous closer would have (on average) accumulated 41 saves, maintained a 2.38 ERA and compiled 206 strikeouts in just 193.2 innings of work. Maybe it’s because he’s due to make a whopping $7.5 million in 2011, or maybe it’s just because no contenders felt the need to make the move for the power right-hander. Either way, it’s astonishing. For what it’s worth, however, the Brewers could almost certainly step up and pursue Bell this offseason — pending whether or not they can resign Fielder, of course. Sure, John Axford has been a gem in the ninth inning and, sure Francisco Rodriguez is under contract through 2012 and holding down the reigns as the setup-man. But something tells me Melvin is up to something. Alec Dopp is a Milwaukee Brewers featured columnist on Bleacher Report. Follow him on Twitter: @alecdopp.